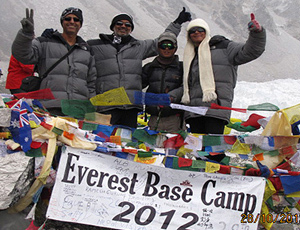 Everest Base Camp trekking, This is our first trekking in Nepal, and we did the EBC in Oct 2012. Through the Internet, we located Nepal Wilderness Trekking. We started liaising with Himal for our needs, and he is extremely prompt, responsive and thorough for all our requests and most of the time exceeding our expectations. Without his help, we wouldn’t have been able to enjoy our trek as much as we did. Even after our trek was completed, he helped us plan and arrange other trips in Nepal. Himal is extremely pleasing and a wonderful human being. Always going out of the way to ensure that his clients are more than comfortable. Needless to add, all our future dealings for trekking in the Himalayas will be with Himal.